I sometimes think I could draw a timeline of my life based on phases I’ve gone through. Several of my earliest years, for example, could be captioned with titles like ‘the Sesame Street sandals phase’, ‘the My Little Pony phase’, and ‘the reading Sweet Valley High under the covers by flashlight phase’. These would be replaced further down the line by ‘the tomboy, dreams-of-being-a-professional-baseball-player-phase’, ‘the inspired-by-Ghost pottery class phase’, and later, ‘the tie-dyed everything, radical vegetarian phase’. Filling in the gaps there were many, many others, some worth remembering and many not, though admittedly most are good for a cringe or two now. One of my longest-running phases, however, not only quietly co-existed for several years with whatever else happened to be occupying my affections, but was remarkably un-cringeworthy: it was, in fact, bread baking. I baked my first loaf of bread when I was nine years old, with the help of my mother. We baked a set of whole wheat loaves from one of the few cookbooks in the house, the Tassajara Bread Book, the now-classic exposition on natural breadmaking written by the head cook at the Tassajara Zen Center in San Francisco. The book itself is delightful, peppered with charming sketches illustrating every step from sponge to loaf, and brimming with Edward Espe Brown’s gentle, confident reassurances that good bread was as easy as following a few simple steps. As for me, even at such a young age I found the strange and cryptic procedures of bread making appealing: the hours spent tending the dough, the intense physical workout of kneading it again and again until it sprang up from the table like a rubber ball, the way the yeast miraculously brought flour and water to life. Though making a few loaves was always a full day’s job, it never seemed arduous – on the contrary, when the loaves emerged piping hot from the oven, it almost seemed criminal that for so little effort we could have something so remarkably delicious. "Bread is the one food that tastes of the love that was put into making it," my mother told me, and I believed her. Some people have used bread making as therapy, and I can fully understand why – nothing is as soothing as nursing a loaf from inception to completion. Things like the rhythmic exertion of kneading, the awareness of details like the temperature of water on your wrist, and the gentle coaxing required to get a perfect performance from the yeast are, to me, something akin to meditation. In fact, I came to enjoy this process so much that over several years I worked my way through not only the Tassajara book but any others I could get my hands on. I kneaded, punched and stretched my way to a knowledge of many types of bread: dense whole grain loaves, sweet braided challahs, puffy pita, chewy bagels; there was even a sourdough starter I managed to keep alive for the better part of a year. Like all good phases, though, this one had a life span, and for whatever reason – dwindling enthusiasm, lack of new recipes to try, or something completely unrelated – I stopped making bread for well over a decade. All of a sudden, however, I can’t seem to get thoughts of breadmaking out of my head. The fact that I have recently discovered the books of master baker Peter Reinhart is probably no coincidence. Like the effect Edward Espe Brown had on me years ago, Reinhart’s words about bread baking fill me not only with an intense desire to get my hands stuck into a bowl of dough, but with the unshakeable confidence that what comes out of the process will be magnificent. He writes with the clarity of a scientist and the simplicity of a teacher, yet manages to convey an enthusiasm about the magic of bread as if he had just discovered it himself. I’ve been particularly enamored with his small volume American Pie*, an enlightening and entertaining chronicle of his search for the best pizza in the world. I’d already tried his Neo-Neopolitan pizza, which was hands-down one of the most flavorful crusts I’ve ever eaten (though the whole experience was slightly dampened by my ineptitude at sliding the pizza onto my new baking stone face up… but well, that’s another story), so when I spotted his recipe for focaccia I knew it was next on my list. Reinhart’s focaccia is not like any bread I’ve made before. It’s slow, requiring at least a day of advance planning to leave time for its trademark overnight fermentation, though the time spent in actual bread-making mode is quite short. It’s also so wet and sticky that you can’t knead the dough outside of the bowl (a fact I found mildly distressing as squishing a viscous, stubborn sludge inside a bowl is not nearly as much fun as slapping it around on the countertop). Any possible misgivings I might have had while making it, however, were more than made up for the instant it was out of the oven and had cooled enough for me to sink my teeth into. This was hands-down the best focaccia I have ever had. I don’t even know how to describe it properly – it was both light and substantial, chewy and soft, wonderfully irregular in shape and texture. And the taste… It was like the very essence of bread, full of fermented yeast and nutty flour and hot oven, permeated but not overwhelmed by a delicate parade of herbs, garlic, oil, and a tongue-tickling sprinkle of spicy chili. Now, I know better than to try to identify a phase before it has even really started, but I have a sneaking suspicion that looking back at this particular point in time I’ll have no trouble identifying the ‘couldn’t stop eating focaccia phase’. And I must say, at least it has a better ring to it than My Little Pony, Sweet Valley High or tie-dyed t-shirts. *I was delighted to see that our dear friend David gets a mention in this book. Apparently he was a dining companion of Peter’s at Chez Panisse one afternoon when, hot on the pizza trail, Peter attended a pizza party catered by Alice Waters herself. I wonder what David thought of the pizza? With a large metal spoon, stir together the flour, salt, yeast, and water in a 4-quart bowl or the bowl of an electric mixer until combined. If mixing with an electric mixer, fit it with the paddle attachment and mix on low speed for about 2 minutes, or until all the ingredients are hydrated and begin to form a wet ball of dough. Let the dough rest for 5 minutes. Switch to the dough hook, add the olive oil, and resume mixing on medium-low speed for 3 to 4 minutes, or until all of the oil is incorporated and the dough is sticky, supple, and smooth; it should clear the sides of the bowl and stick just a little to the bottom. If the dough seems like a batter and does not have sufficient structure to hold itself together, mix in more flour by the tablespoonful. Even though it is sticky, the dough should still pass the windowpane test. If mixing by hand, repeatedly dip one of your hands or the spoon into cold water and use it much like a dough hook, working the dough vigorously as you rotate the bowl with your other hand. As all the flour is incorporated and the dough becomes a wet ball, about 3 minutes, stop mixing and let the dough rest for 5 minutes. Add the olive oil, dip your hand or spoon again in water, and continue to work the dough for another 3 to 4 minutes. The dough should be very sticky, but it should also have some texture and structure. If the dough seems like a batter and does not have sufficient structure to hold itself together, mix in more flour by the tablespoonful. Even though it is sticky, the dough should till pass the windowpane test. Form the dough into a ball and place it in a bowl brushed with olive oil. Turn the dough to coat it with the oil, cover the bowl with plastic wrap, and immediately refrigerate it overnight. The next day the dough should have nearly doubled in size. Allow it to sit at room temperature for about 2 hours before making the focaccia. In a bowl, whisk together all the ingredients. Let sit at room temperature for 2 hours before using. Line a 12 x 17 sheet pan with baking parchment or with a silicone pan liner. Drizzle the 2 tablespoons oil onto the parchment and spread it over the surface. Working gently, scrape the dough into the prepared pan. Try to degas it as little as possible. Drizzle the herb oil over the surface of the dough, creating dimples and pockets all over the surface for the oil to fill. Do not press the dough outward toward the edges of the pan; instead, simply press downward at only a slight angle toward the edges. The dough will probably fill the pan a little more than half full before it begins to become elastic and spring back toward the center. When this occurs, stop pressing, and let the dough relax for 15 minutes. Repeat the dimpling process, beginning at the center and gradually working out toward the edges of the pan. Try to keep the dough somewhat even across the top. Let it rest again for 15 minutes. Repeat the dimpling; this time the dough should have stretched to fill the pan (don’t worry if it doesn’t quite reach the corners, as it will continue to expand as it rises). Let the dough rise at room temperature for 2-3 hours, or until doubled. Preheat the oven to 500°F (260°C). Just before baking, sprinkle the salt evenly over the top of the dough. Place the sheet pan on the middle shelf of the oven, then immediately lower the temperature to 450°F (200°C). Bake for 20 minutes, then rotate the pan 180 degrees. Continue to bake for 10 to 20 minutes longer or until both the top and underside are golden brown and slightly crisp. Remove the finished focaccia from the oven and immediately transfer it to a cooling rack, removing the paper as soon as it is cool enough to handle. Cool for at least 20 minutes before cutting and serving. you are the greatest. your prose, pictures and recipes are an inspiration. Thank you! btw what type of camera do you use? are you naturally adept at photography as you are with baking? i too would like to photodocument my (albeit subpar yet proud) creations. Melissa, this was such a pleasure to read, on so many levels. There is the always-abundant pleasure of your words and your photographs, both of which are singular. There is the pleasure of reading of another convert to the long, slow, cold rise, which I think makes for superior bread. And there is the pleasure of the sheer joy you take in Peter Reinhart’s books. I am a big fan of Chef Reinhart; I have attended three of his classes, where I have eaten some of the best bread ever to be dropped into my hands. His voice is as friendly and compelling in person as it is on the page. He is also a very, very funny guy. Should you find yourself over here at the same time that Chef Reinhart is touring/teaching again, I will pay for you and I to attend class together. I will do it so fast that my credit cards will burst into flames. Sonic booms will be heard. :)I have never tried his recipe in American Pie, but I’m betting that it resembles the one in The Bread Baker’s Apprentice, a book I just adore. My own focaccia of choice is the Focaccia alla Genoa in Carole Field’s book Focaccia. It is made with white wine and olive oil in the dough, and it is ridiculous how delicious this is. I have fiddled around with the recipe, cutting way back on the yeast and increasing the fermentation time on both the sponge and the final dough, and the difference in taste, crumb structure and translucency is amazing — although I hasten to add that if you make it just as Ms. Field instructs you, with the full amount of yeast and the short fermentation time on the sponge, you’ll still get a grand focaccia.Did I mention that your picture is beautiful and your prose is brilliant? Can I mention it again? Bakerina knows whereof she speaks. Lovely post. In addition to the merits of slow cold rise (and certainly Bakerina knows much more about this than I do), you may find that you like other very sticky dough breads, many of which I think are ridiculously good, in the manner of chewy, with big holes and lovely crusty exteriors.I have never met P. Reinhart, but in addition to being very fond of several of his breads, I love his best ever ordinary coleslaw recipe-from <i>Brother Juniper’s Cafe</i> a little book he did before he began to concentrate on bread. There’s nothing unusual in the recipe at all, it just happens to make perfect, and infallible coleslaw. The sticky dough problem reminds me of the glop I thought I was producing while making Maggie Glezer’s ciabatta – instead I was rewarded with some of the best bread ever. Just goes to show. I can’t wait to try Reinhart’s pizza recipe – thank you for the glowing recommendation! Dear Melissa,I would love to try your latest recipe, and I would love to imagine, as I always do before a recipe, that it’ll turn out perfectly, but i won’t cos i know it’ll only lead to a broken heart…because (sob!sputter!sob!) my doughs won’t rise…. Is there anything more deflating than a dough that won’t rise, despite your bestest efforts and hopes??!!?? I’ve made a number of attempts now, and i swear that i follow every darn instruction, i’ve researched on the internet, but something is just wrong, and i don’t know what. Yet, i love bread and I don’t want to give up! I know yours is not a bread website, but if you can help me solve the problem of why my doughs refuse to rise, i will dedicate my first successful bread to you, and you may have the first (virtual) bite,a nd every other too :))I know it’s hard to prescibe a solution since bread-making is so specific and you don’t know the conditions of my kitchen etc., but would you have some expertise to spare for the questions below? I will try to be as specific as possible.My oven is normal, certainly not the best you can get, but functions otherwise.I live in Singapore, so room temp is 30-32 degrees thereabouts, very humid (all of which i thought was conducive to bread-making, and yet! )1.I use Instant Yeast (as marked on the container). Do i still need to proof it? I was under the impression that instant yeast allows one to mix it immediately into the dry ingredients. I’ve read that adding salt immediately to proofed yeast can kill it. With instant yeast, can i just add salt together with flour and yeast, as indicated in recipes? I should add that my bottle of instant yeast was BRAND NEW, so it couldn’t be expired….2.Recipes call for adding "warm water" – what exactly is warm? I will get a thermometer after these catastrophes! but I’ve used lukewarm water and slightly warmer than lukewarm water, and i still fail. My gauge for "warm water" has been something that’s comfortable enough for my elbow/ wrist (the way you test milk for babies), is that good enough as a gauge? (you should see me, how i juggle pots of water to get the "right" temp…)3.What sort of reaction should i expect to see/smell in dough? If i don’t see something within 5-10 mins, should i just forget it?4.I’m sure i knead for long enough- exceeding even 15 mins, though perhaps the technique could do with some improvement. Can longer kneading "save" a dough that’s not reacting? Is there such a thing was over-kneading? if the dough is tough, can i separate dough into two balls and work separately, combining them together for a final knead?6.Some bakers recommend wrapping cling foil around the dough, some TIGHTLY across the bowl, some LOOSELY across the bowl, what to make of these contradictory recommendations? Recipes call for placing it in a "warm place" – what constitutes warm? I’m sure our kitchens across the world vary greatly in temperature! Also is it importnat to keep out excessive light? I’ve also read recommendations for placing it in a draughty place.7.In desperation, after waiting in vain for the dough to rise, I’ve even attempted to "jump-start" the rising process by placing the bowl containing the dough under the sun, on top of hot ovens or stoves, which did make it rise a little but expectedly, only yielded final products that were tough and yeasty-tasting. How bad is exposing dough to too much heat? Is that a sure way to kill your bread? Should i have been patient? I waited for a few hours though, and hardly felt any heat from the bowl (from the fermentation process) nor smelled anything, before i resorted to these desperate measures. Is there any way to "save" the dough once all the ingredients have been mixed? 8. If i can’t be around the whole afternoon to bake, at which stage can i interrupt the process? Can I leave the dough to rise (or not rise, as in my case:)) ) for a few hours without heeding it? Or can i leave it for a few hours after it has been punched down, and shaped in bread pan? should i leave it under room temperature or in the refrigerator ( not freezer). If i should leave it in the refrigerator, how will it affect yeast action? Should i allow "thawing" time?if you could even nudge me in the rigth direction, or shed any sort of light on this kitchen mystery of mine, i’ll be very grateful indeed.In the meantime, happy baking and i’ll stick to cakes for now. this would be good with a warm crab & artichoke dip. I haven’t had much experience baking breads, having been more of a cakes-and-cookies baker since, well, always, it seems. But this lovely post makes me want to start playing with yeast and flour and water, and seeing what manner of bready creations I can coax from these simple ingredients. Thanks for the inspiration! Your recipes & photos are a pleasure ! Thanks for sharing. Melissa,I was not much older than you when I baked my first loaf. And I have two batches of bread (sourdough and a European rustic loaf) going as I write this. You’re a genius! I am having focaccia for lunch today! It is the best bread ever! Peter Rheinhart is beautiful with bread and words as are you. 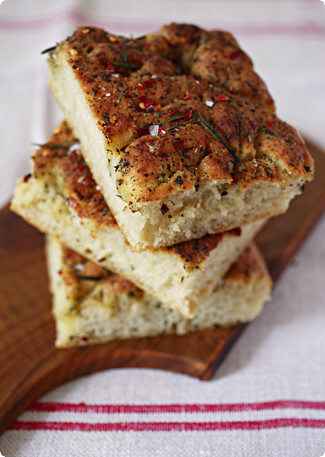 I love your posts and I really have a soft spot for focaccia! Thank You. When my eyes met your picture, I knew I had seen that bread before… so I did a quick skim for that magical name in bread making: Reinhart. If anyone has yet to pick up the Breadmaker’s Apprentice or American Pie, just go out and do it. Gosh, I feel like I’m advertising for him, but the books are really good. I glance at other bread books in the bookstore and usually just set them back down, content that I have the best.If anyone is having second thoughts about taking the time for this recipe, throw them out the window. This is, by far, one of the best focaccia’s I’ve ever experienced, and it truly is easy to make.For those of you who just can’t wait overnight and have a full afternoon to bake, you can just do the refrigeration rise on the counter again, and continue. Although skipping a refrigeration rise may be detrimental to sourdough, Peter’s focaccia can stand up to it. It will lose a touch of nuttiness, but I would bet it will be better than any fococcia you’ve tasted before. namnam, i will try to fight my kitchen-laziness n bake that, i love foccacia, n i tried jamie oliver’s (yeah, of course..:)) recipe some years ago but it was disappointing. i m sure yours won’t be!ps! i ate ur bag of smash…! sorry, will get u another for easter n post it to stop me from eating it again. sorry! I have that book…unfortunately, like with most cookbooks, it’s difficult to find enough time to try the recipes. But he is a master — can’t wait to try this one. A Tom boy playing baseball? I wish I could have seen that part! 😉 And fully agreeing with you Melissa, bread making, feeling dough, working hard at it is a great energy release. It feels good! I can imagine the smell in the house from fermentation. Lovely focaccia! I, too, have recently discovered the joys of home-baked bread and foccacia in particular. I got my recipe from The Bread Bible. Greedy: your problem, I believe lies here: "3.What sort of reaction should i expect to see/smell in dough? If i don’t see something within 5-10 mins, should i just forget it?"NO! Patience, young one. Don’t watch it. Stick it in a warm (room temperature) place and go about your business for a couple HOURS. Don’t worry. The yeast will do their thing eventually and slowly. A rise is not a 5-10 minute process. Give it some time and let us know how it goes. Hi Krishna – Thank YOU, that is wonderful to hear! To answer your question, the pictures on this site have been taken with a number of different cameras, including a Canon Powershot A80, a Nikon D70, and most recently, a Canon 5D. If I can give you any further advice, please let me know.Bakerina, I have been blushing madly for a week now! Thank you, my dear, for your incredible genorosity of word and spirit (not to mention wallet!). If I could manage it, I’d hop on a plane to New York next week (though perhaps I’d stop to check Peter Reinhart’s schedule first). One day, I’m sure, we’ll have the opportunity to bake focaccia together, along with plenty of other yeasty delights to tide us over while it completes that long, slow rise. In the meantime, I will certainly check out your tip on Carole Field’s version. I just may have to pit it head-to-head with my new Reinhart benchmark! :)Lindy, I think you may be right – the sticky breads are the way to go. I feel like I’m discovering breadmaking all over again! And I’ll definitely try to track down a copy of his Juniper Cafe book – after all, his taste hasn’t failed me so far! Hi Luisa – It does seem to fly in the face of all my previously-held breadmaking wisdom, but as you say, these wet doughs produce some mighty fine loaves (not to mention crusts – as you’ll no doubt find when you give Reinhart’s pizza dough a whirl)!Hi Greedy Fan – I can understand your frustration with bread, especially if you’ve tried several times and had nothing but failures. I’ll try to give some brief thoughts on your questions, but my main piece of advice would be to go out and buy yourself a really good breadbaking manual – my vote would be for Reinhart’s ‘The Bread Baker’s Apprentice’ – and follow its recipes religiously a couple of times. It will probably also answer a lot of your questions better than I can.1. Instant yeast, also called fast-action or quick-rise, does not need to be ‘activated’ before using it – just dump it in with the rest of the ingredients (including any salt). If you’re not sure if you really have instant yeast, or if you want to test its freshness, you can soak it in a bit of body-temperature water (should feel neither hot nor cold on your wrist) with a pinch of sugar and wait 5-10 minutes for it to start foaming before proceeding. 2. The standard way to test the temperature is to dribble a bit on your wrist, where it should feel neither hot nor cold. If you’re using instant yeast, however, the temperature is not so crucial – but err on the side of coolness, as too much heat might kill the yeast. In fact, with instant yeast you can use cold water, as in this recipe.3. You might not see anything happen for a long time, as much as an hour, or even more, depending on the type of dough and the ambient temperature. What happens is that the dough will slowly start to swell, though it can be almost imperceptibly slow. Just keep checking until it has reached the size the recipe specifies – usually about double its original size.4.If the problem is the yeast, no amount of kneading will ‘save’ the dough. And yes, it is possible to over-knead, which is why referring to a good book is really important – it’ll tell you exactly the texture you’re trying to achieve for each particular recipe, and approximately how long it should take to get it there. Over time you’ll know what signs to look for yourself.5. It really doesn’t matter whether you wrap the bowl tightly or loosely – it doesn’t have any effect on the rising, it just helps keep the dough from drying out while it rises. I usually cover loosely with plastic or a towel for rising at room temperature. Draughts only matter if they might chill the dough, which will slow it down. Also, warm should always be room-temperature warm, and I’m sure that unless your kitchen is heavily air-conditioned, the ambient temperature in Singapore is more than adequate. Dough will rise at a wide range of temperatures, so precision is not so important. And according to Peter Reinhart’s philosophy, the longer the rise, the deeper the flavor, so he has the majority of rising take place overnight in the refrigerator.6. It’s not a good idea to ‘jump start’ the dough. For one thing, you’ll have poorer flavor the faster it rises (see above), and for another, you run the risk of overheating (and killing) the yeast. Better to just let it do its thing for as long as it needs. Oh, and there won’t be any outward signs of the rising process apart from the bread swelling.7. While you do have to pay attention to the bread’s schedule to a certain extent, if you’ll want to interrupt the breadmaking process the best thing is to put it in the refrigerator at the start of its first rise, where you can leave it several hours, or overnight. This will actually improve the texture and flavor overall (see above). Just let it sit out for a couple of hours to come back to room temperature before proceeding with the recipe.I hope this has helped clear things up a bit. My advice is no substitute for a good book, however, and I hope that you’ll manage to get ahold of one. I have no doubt that good bread is easily within your grasp! Hi Kat&Satoshi – I certainly agree! Have any favorite recipes you’d like to share?Hi J – Ah yes, that amazon basket! Funny how every time I log in to my account a few new books have snuck in, hoping I’ll press that ‘send order’ button before I realize they’re there! I can assure you that Carole Field’s book is right there near the top of the list, just waiting for me to gather up the courage (and the funds) to proceed to checkout. And yes, I couldn’t agree more about Peter Reinhart. That man knows his bread! Hi Tania – While I love baking cakes and cookies too, there is something about bread that is fulfilling in a different kind of way. Maybe it’s that every time I pull a loaf out of the oven I feel like I’ve just witnessed a small miracle 🙂 I’m so happy to have inspired you!Hi Sonali – Thank you! Hi Kevin – Ah, you see, clearly there must be a connection between childhood breadbaking and culinary genius! 😉 Hi AY – I hope it was good 🙂	Hi Tanna – Thank you, and I have to agree about the bread – it doesn’t get much better than this, does it? Hi Rick – Between you and me I’m certain we’ve managed to create another few Reinhart converts around here. Maybe we should approach him about jobs in his PR department? 😉 Thanks for your thoughts. Hi googs! I suppose I can forgive you, and to be honest, I wouldn’t last a day around a bag of smash myself 😉 As for the focaccia, I’d be delighted if you tried it. Maybe you’ll have to plan a day trip down to Edinburgh to get a hands-on tutorial! Hi Janice – I know the feeling… too well! But I can assure you that should you feel the urge to give this a try, the results will be well worth the effort. I love the fact that Peter’s recipes are not only so good but also foolproof – even though I have so many books vying for my attention, his always remain near the top of the pile. Bea, I would happily send you a picture if I could find one! But trust me, it wasn’t a big stretch to go from kneading dough to swinging a baseball bat – in fact, each one made me better at the other by building up those arm muscles. And that’s something I am certainly in need of these days ;)David, well now that I know that pizza’s involved, I’ll simply HAVE to come! 😉 Who knew the Parisians could give the Italians and the Berkeleyites a run for their pizza money? And I agree with you that any breadbaker, experienced or not, will benefit from Reinhart’s books. But I imagine we’ve convinced people of that already!Hi Fledgling Foodie – Thanks for your thoughts. I hope Greedy is able to overcome those dough-hurdles soon! With any luck focaccia will be the magic recipe. photos magnifiques, je rêve de focaccia depuis mon retour de Toscane, un brin de Sienne dans mon assiette, le rêve. A quand une traduction en français de cette magnifique recette? Hi melissa and others who have offered their suggestions,Thanks for the advice! Haven’t had the time to bake of late, but i will do what you ahve suggested for a start: just leaving the dough alone, and if it still doesn’t happen..we’ll cross that bridge when we come to it!cheers! Hi,Melissa:I happened to run into your website the other day and saw the focaccia picture, it drew my attention. I too, like you, love to bake bread. I also own a couple of chef Reinhart’s bread books. I love to make bread, watch other people make bread, and talk about bread… anything about bread would get me excited except for… eating bread – I am not crazy about eating bread. Well, the reason I am excited about bread is because I have a husband who loves bread! Anyway, the reason I write is I was wondering if there is some sort of bread baking club that I can join that you know of? If your prose is like poetry , i wonder how your poetry would be like ! Just love your Blog- hope i gather some guts soon enough to do a home-baked focassia- your writing has inspired me so much!